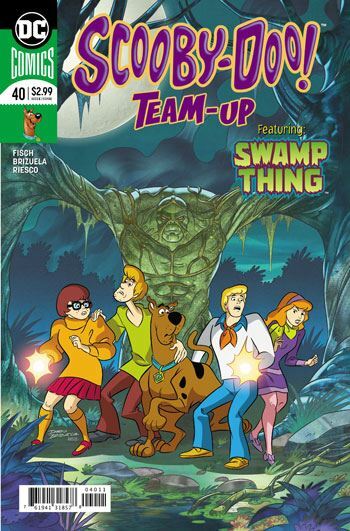 Scooby-Doo Team-up #40 sees the Mystery Inc. gang team up with Swamp Thing to stop an evil Voodoo Queen in the Louisiana swampland. This is a fun comic that would be great for kids and the kid in all of us. This series as a whole does a great job capturing the feel of the Scooby-Doo cartoon and blending that in with the world of DC. From the art to little character moments, this feels just like an episode of Scooby-Doo Meets (insert outside character here). The dialogue is so true to the characters that you will more than likely hear the voices from the cartoon as you read the book. Mystery Inc. also fits in seamlessly with a lighter take on the DCU. Scooby and the gang are investigating mass disappearances around the swamp. They discover that a Voodoo Queen has turned people into zombies using a potion. As the gang repeatedly tells Shaggy, these are not the undead brain eating zombies of the movies but rather mindless servants for the Voodoo Queen. The real surprise of the book is when Solomon Grundy shows up with a vendetta against the Mystery Inc crew. Not only was I not expecting a villain of the DCU to appear, but Grundy even references crossing paths with Scooby and the gang in issue #6. Maybe my expectations were too low, but inter-series continuity from Scooby-Doo Team-Up was a welcomed bit of continuity. Swamp Thing also works great as a character for Mystery Inc. to meet. Daphne and Velma even joke for a panel that they already met and unmasked a Swampthing. Hilariously, Velma explains that was “Swampthing”, not “Swamp Thing”. This self aware moment of humor feels right out of the cartoon. And as Daphne remarks, it's nice to see a giant swamp monster of Mystery Inc.'s side for once. Swamp Thing of course uses his powers of the Green to speed up the zombie potion in the Voodoo Queen's victims, but this honestly doesn't really matter much. In a book like Scooby-Doo Team-Up, it's not the destination that matters but how you get there. This book provides a fun ride with a neatly wrapped up story. I highly recommend this book for anyone who is a fan of the cartoon.